Toronto, Canada’s largest city and listed amongst the top ten largest cities in North America by population, is a leader in solid waste management. Continuing that theme of responsible city management, Toronto has collaborated with Enbridge Gas Distribution Inc. to build one of the first renewable natural gas (RNG) facilities in Canada which will generate fuel for the city’s waste management fleet. 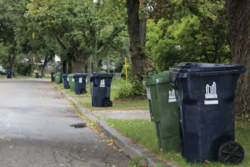 Toronto’s more than 600 vehicles collect waste from approximately 1.6 million garbage, Blue Bins and Green Bins. 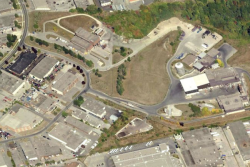 The RNG facility, located at the Dufferin Organics Processing Facility, will be constructed by Enbridge Gas Distribution and the City of Toronto to turn organic waste (apple cores, egg shells, coffee grounds, etc.) into clean energy. Almost 50 per cent of household waste (by weight) is organic material. When organic waste breaks down, methane is created. Many municipalities burn the methane produced from waste facilities and sewage treatment plants, throwing away this valuable energy resource and opportunity to lower their greenhouse gas emissions. Instead, through this facility, the methane can be captured, cleaned and used like traditional natural gas. It is carbon neutral, and has the same environmental benefits as renewable electricity. Expected to be complete in 2019, the project supports the City’s vision of using Toronto’s organic waste to offset greenhouse gas emissions. As an added benefit, the newly created carbon-neutral, renewable natural gas will be injected into the natural gas distribution system to fuel the very trucks that picked up the Green Bin waste. Anaerobic digestion expansion at Dufferin will allow 90% of organics to be turned into biogas for subsequent processing to produce biomethane/RNG fuel. Renewable natural gas (RNG) is a type of green gas. It is a carbon‐neutral, sustainable fuel that is created from decomposing organic waste. From a greenhouse gas emissions perspective, RNG demonstrates tremendous benefits. Methane that otherwise would have entered directly into the atmosphere is transformed into RNG. The Ontario Ministry of Energy (Fuels Technical Report) believes that RNG can replace up to 15 per cent of Ontario’s conventional natural gas supply by 2035. Enbridge and the City of Toronto estimate that more than 5 million cubic metres of RNG could be produced each year at this facility. That’s enough to fuel 132 garbage trucks, 90% of the City’s fleet (or heat more than 2,000 homes). 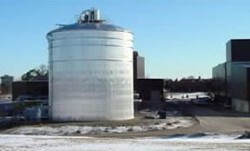 The Dufferin facility was North America’s first full-scale municipal source-separated organics processing facility to use anaerobic digestion. By utilizing anaerobic digestion, the City is able to divert more waste from landfill disposal, generate and collect biogas as a recoverable resource and supply digested nutrient-rich material for commercial compost. Enbridge Gas Distribution Inc. is Canada’s largest natural gas distribution company and is owned by Enbridge Inc., a Canadian-based leader in energy transportation and distribution.